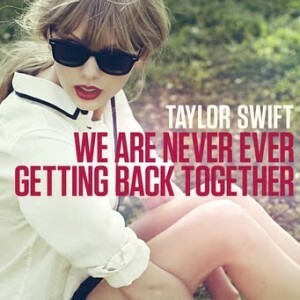 Taylor Swift’s new single ‘We Are Never Ever Getting Back Together’ looks to be on track for a massive week around the world, especially in the United States, where the track is poised to break records after just one week on sale. Stateside, the single (the first to be lifted from the singer’s forthcoming album ‘Red’) has not only been picked up by radio stations across a range of different formats, but first-week digital sales are super strong, with some predicting the track could sell up to half a million downloads in just one week. Given the Billboard singles chart is made up of combined airplay and sales statistics, it’s expected that the track will achieve nothing less than a massive No.1 debut on this week’s chart. Here in Australia, meanwhile, Taylor’s local fans have also responded, with the single rocketing into the top five on the local iTunes singles chart. And after just three days at Australian radio, Universal Music tells us that ‘We Are Never Ever Getting Back Together’ was last week’s No.1 Most Added track locally. With thanks to The Music Network, look for the list of this week’s Most Added songs on the site later today. We Are Never Ever Getting Back Together did indeed already debut on the Billboard Hot 100 at #72 on Thursday.